Welcome to Day #4 of Trick or Treat Theme Week. Halloween was yesterday; but I have plenty of treats leftover for the rest of this week. Skeletons are always in fashion for Halloween. However, today's Organic Milk Chocolate Skull from The Tea Room (San Leandro, CA) might be just as fitting for the Day of the Dead, or Dia de los Muertos*. 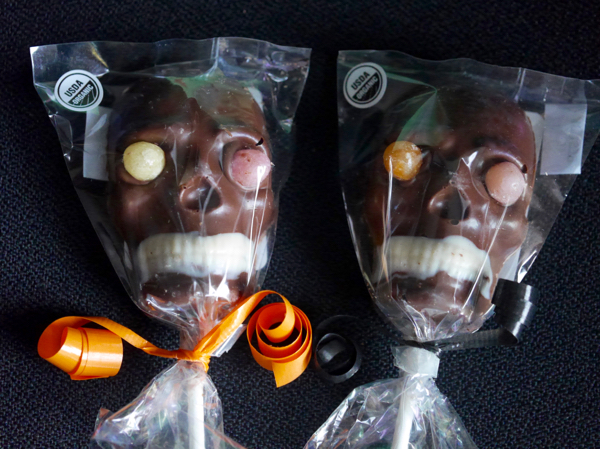 This celebration of the dead originated in Mexico and spans two days (today and tomorrow). 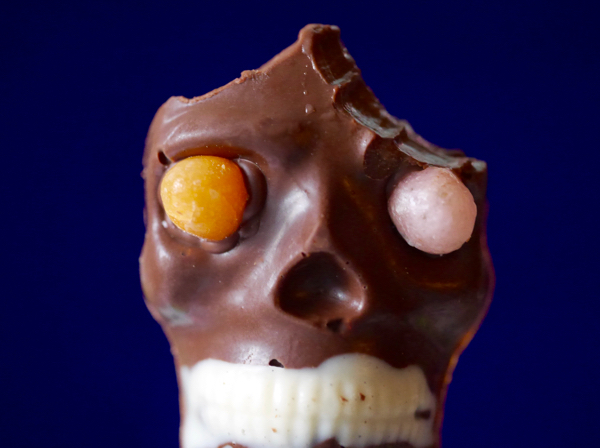 The occasion conjures up images of skeletons and decorated sugar skulls and—increasingly as we've adopted some elements of this traditional holiday in the U.S.—chocolate skulls. The Tea Room specializes in chocolates flavored with a variety of different teas. 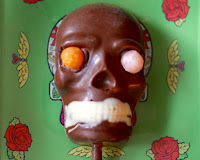 At first bite, this milk chocolate skull on a stick with protruding jelly bean eyes tasted like conventional milk chocolate. However, the initial flavor gradually evolved into one with caramel overtones. This chocolate with infused with the company's "Caramel Blend" with organic honeybush tea and caramel oil which gave it an authentic caramel warmth and flavor. *The origins of the Dia de Los Muertos celebration dates back to the Aztecs, as far back as 3,000 years ago. The original, longer, celebration took place during the 9th month of the Aztec calendar (closer to August-September) and honored a goddess, the "Lady of the Dead."